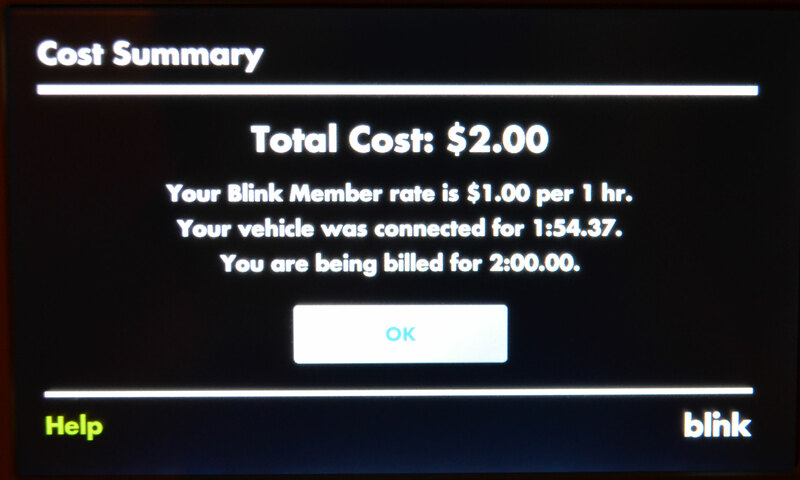 As of September 1st 2012, Blink Networks started to charge Blink Charging Station users a fee. This ranges from $1/hr to $2/hr depending on your ‘membership level’. Some site owners have elected to keep their charging stations free rather than levy such a fee. This post highlights some of the Blink site owners who are EV friendly by keeping fees free. Kohl’s (All Tennessee locations with charging capability). Hat’s off to Kohl’s, City of Knoxville and a number of businesses in the Gatlinburg/Pigeon Forge area. It’s worth noting that quick charge stations at Cracker Barrel restaurants are still free until later this year, though the Level 2 units do now levy a fee. ChargePoint Units are still free in Tennessee as are independently owned units at places such as Whole Foods and Publix who own their equipment and are not part of a charging ‘network’. All Nissan and Mitsubishi dealerships are free to use (if you can get parked close to the units). The only way I have of identifying free units at this time is by hovering over charging stations on the Blink Map at their main website. So please let me know if I have missed any and I will add them to the list above. Let’s help promote the site owners who choose to keep EV charging free for their customers and employees/visitors. Plugshare plan to offer a filter to find free stations, but it is not operational just yet. I am disappointed that City Halls in TN charge a fee, our taxes pay for their facilities and wages. (Worthy of mention is the City of Knoxville for making a handful of city parks free for EV users). I also question hotels charging a fee, because the fees are for connect time, NOT charging time. One could be charged a big fee while your car is attached but not charging overnight at a hotel. Getting up at 1am to disconnect it when charging is complete isn’t reasonable. One unexpected benefit from being charged a fee is that I no longer feel guilty parking and using a Blink unit if I do not enter the owners business or buy their products/services. So far this month I have paid $6 in fees and consider this a way of supporting the EV charging network in TN. I don’t advocate a boycott of places that charge a fee, that’s their choice; but let’s make a noise when we see owners keep them free and give them extra business!! An unintended consequence of charging fees is that ‘opportunity’ charging will all but die out. One used to opportunity charge whenever possible even if travel plans didn’t warrant the charge. One never knew when you might decide to change your plans, having the extra charge was a good way to ensure the car got you where you needed to go without concerns. Random Fact: Facebook in California keep their Blink locations free. This entry was posted in Blink, ChargePoint, Electric Car, Level 2 EV Charger, Level 3 EV Charger, Nissan LEAF and tagged facebook, knoxville, lake tellico, northcrest medical center. Bookmark the permalink. I agree about the no-fee charging merchants, I will support Kohls, Whole Foods & Publix. FYI: the Publix near Whitebridge & Harding has a free charger in the lower level garage. I sent an email last week to Stephanie Cox(Ecotality) about charging fees on Blink chargers. I told her the one hour fee segment was unworkable(15minutes makes more sense). I expect fee based Blink public chargers in Nashville to collect even more dust than they were already collecting. I agree a more granular time segment would encourage use of the Blink Units. I did pay $11 last month in fees and so far this month have incurred $5. My cost per mile has risen from about 2c to 3c. Recently I got charged $1 for a a failed charge at Cracker Barrel. I emailed Blink from the restaurant and a credit was applied within 24hrs. Their customer service is still good I’m glad to say. let’s hope they are able to make the fee system fair. I’m sure the majority of property owners are unaware they could elect for free charging to attract business, and probably don’t even realize fees started last month. I wonder what the cost to the property owner is if they keep the charging free? I doubt Blink give that option without increased fees to the property owner. I’ll give Publix mention in my post. I see they got an Eaton unit there. Wish Publix in Hendersonville would get one, I inquired and got platitudes.